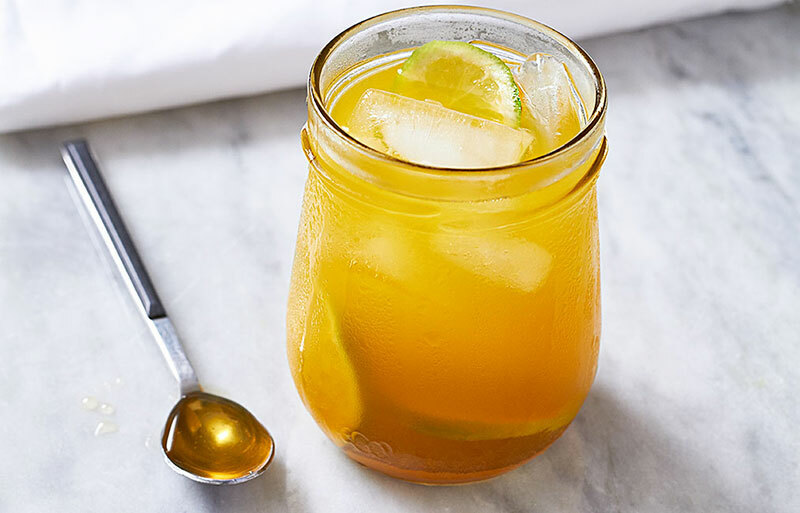 This refreshing turmeric & ginger iced tea is excellent beverage for your health. It is great way to ensure that your body, brain and heart get enough liquids during the day. This drink helps to battle dehydration and boosts your metabolism. Your body can easily dehydrate. This situation can lead to some serious side effects. Our blood becomes thicker and it can cause resistance to blood flow. All that can result in high blood pressure, increased cholesterol because the body actually tries to prevent water loss from the cells. It can also lead to a higher risk of obesity, type 2 diabetes, and even cancer. We are all aware of the importance of drinking a lot of water every day. Sometimes we forget because we are so busy, sometimes we just don’t want to drink it. Try to switch some of that water quantity by this amazing iced tea. You will definitely achieve hydration goals without getting unwanted and empty calories, but you’ll be promoting better health while enjoying lots of flavor. Each of these ingredients of the Turmeric & Ginger Iced Tea offers unique health benefits. It is number ONE killer of Heart Disease. Curcumin which is a powerful compound of turmeric, helps to improve the function of the endothelium. It is the lining of the blood vessels. An endothelial dysfunction is a significant factor in this disease. It is much more difficult for the endothelium to regulate blood pressure, blood clotting, and other essential processes. Turmeric also supports brain health. Another compound in this ingredient can actually increase neural stem cell growth in the brain for 80 % if we take it in specific concentrations. The conclusion of experts is that this compound could help those who suffer from diseases like Alzheimer’s, as well as stroke victims to recover brain function. Ginger is warming spice that has numerous medicinal benefits from its gingerols. It is actually the oily resin from the ginger root that offers powerful antioxidant and anti-inflammatory properties. It helps in process of reducing cholesterol levels, preventing atherosclerosis, preventing bad cholesterol or the oxidation of LDL. Ginger also benefits the brain by increasing levels of important neurotransmitters. The brain cells use those chemicals to communicate with each other. They control the ability to focus, concentrate, remember, sleep etc. Studies have estimated that 86% of American adults have suboptimal levels of neurotransmitters, so consuming more ginger by drinking this tea may be a great way to boost yours. Honey gives excellent sweet taste to the tea and it offers a lot of health benefits as well. It improves general health and brain health, particularly in women, who tend to suffer from hormone-related intellectual decline during post-menopause. Honey contains high level of antioxidants and it may help prevent brain cell loss and cellular damage. Finally, the simple recipe includes little bit black pepper, which not only makes it tastier, but it helps make the nutrients more accessible for use in the body’s various systems. Measure the ginger, turmeric and black pepper and place them into small saucepan. Cover with the 1 cup water (for steeping) and bring to a boil. Reduce the heat to simmer. Simmer for few minutes and then turn off heat. After you turn off the heat, you can add the honey. Cover the saucepan and let it steep for at least one hour, for a stronger concentration, you can let it steep overnight. Strain the mixture using cheesecloth to remove some of the fresh ginger or gritty powder This will make the texture smoother. You can store the concentration and make one drink at a time or add the 3 cups water and store in a quart sized jar in the refrigerator. You can add more water depending to the taste you are looking for. The same goes for sweetener.